Features gussets and self-opening thumb notches. Recyclable and biodegradable; certified SFI and Cedar Grove. 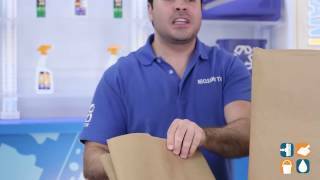 Product and packaging contain recycled content. Standard-Duty Paper Grocery Bags 500 paper bags per bundle. 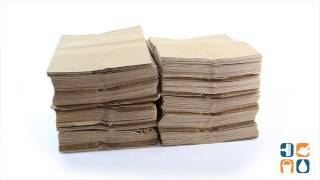 Brown Kraft Standard-Duty Paper Grocery Bags, 12"x 7"x 17", 500 Bags per Bundle. The bags were used at a church rummage sale for customers to gather their purchases. The quality of the bags was good. Am using for recycling. Bags are very sturdy. Friends and neighbors may need bags for recycling, too.